The Mattei Affair (Italian: Il Caso Mattei) is a 1972 film directed by Francesco Rosi. It depicts the life and mysterious death of Enrico Mattei, an Italian businessman who in the aftermath of World War II managed to avoid the sale of the nascent Italian oil and hydrocarbon industry to US companies and developed them in the Eni, a state-owned oil company which rivaled the 'seven sisters' for oil and gas deals in northern African and Middle Eastern countries. The film shared the Grand Prix with The Working Class Goes to Heaven at the 1972 Cannes Film Festival. Italian star Gian Maria Volontè was the leading actor in both films. The film is an innovative hybrid of documentary and fiction, representing Francesco Rosi’s concept of cine-inchieste (film investigation). 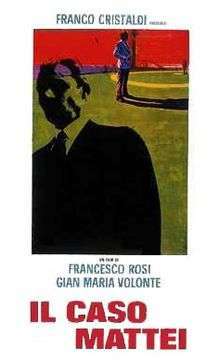 The flashback structure shows the influence of Citizen Kane and Rosi’s Salvatore Giuliano (1962). Rosi remains faithful to his neo-realist roots with on-location shooting and non-professional actors. The film is interspersed with footage of the director trying to find his friend, the investigative journalist Mauro De Mauro, who disappeared while doing research for the film. He was killed by the Sicilian Mafia, but like the death of Mattei, De Mauro’s case was never solved. ↑ "Festival de Cannes: The Mattei Affair". festival-cannes.com. Retrieved 2009-04-13.